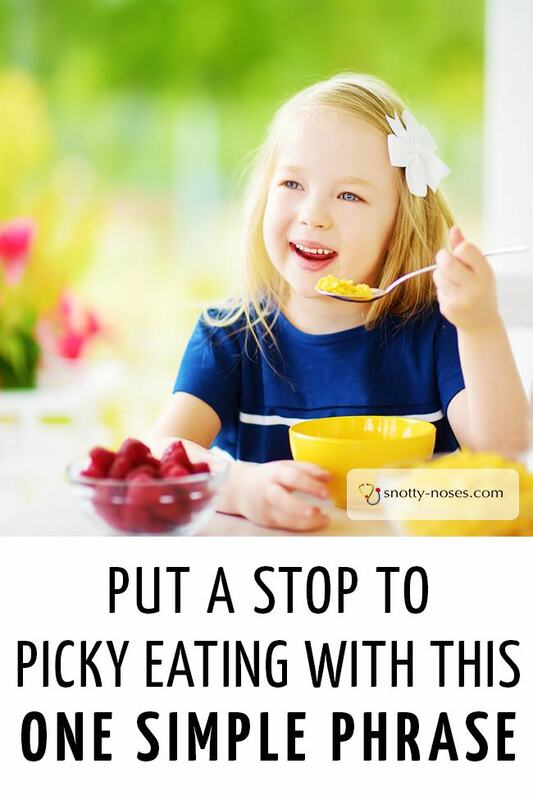 Unless you have a picky or fussy eater, you don't understand the total frustration of mealtime battles and trying to get your child to eat a healthy and balanced diet. One of my children’s favourite food is cheese on toast. A few nights ago, I made ‘welsh rabbit’ for supper. Think posh cheese on toast. It’s basically ‘deluxe cheese on toast with egg in it’. That ‘super mom feeling’ glowed warm inside. It was easy, simple, a new recipe. It was going to to be a great hit. And it was a great hit for most of us. Galen refused to touch it. Not even a small mouthful. Not even a tinsy tiny morsel. I gently encouraged him. “It’s just cheese on toast!” I said. “It looks like it’s got poo on it!” he replied. I have to confess, I struggle not to pressure him to eat. He’s the kind of child who, if he doesn’t like something, or has taken a dislike to something, would rather go hungry than give it a fair go. It’s frustrating. It’s more that frustrating. It’s agony. "HOW DO YOU KNOW YOU DON'T LIKE IT IF YOU WON'T TRY IT?" Sometimes he even has to walk away to calm himself. Research shows that if you force children to eat things, it often has the opposite effect. They eat less of the desired thing. The more you push, the less they eat. You’re making it more difficult for them to take that step of spontaneously trying it, getting used to it and properly deciding if they like it or not. Not only that, but pressuring children to eat has been linked to eating disorders and a bad relationship with food later in life. Plus fighting over food is really stressful for everyone. When I step away, I don’t understand WHY I get so upset. I know that I want to teach my kids to love healthy food, to actually choose to eat it rather than to eat it because I am telling them to. But in the heat of the moment, it's easy to forget and to resort to encouraging, pushing or forcing. Why Don't Kids Like New Foods? It's an evolution thing! The theory is that it stops them from eating poisonous berries. The reality is that they say "I don't like" it when they mean "I don't know it, it's strange and unfamiliar and I'm not happy wolfing it down." Actually, when you put it like that, it's not that unreasonable but as parents we want to override that learning time and just skip to the "healthy eating family", kids with good table manners who make polite conversation. We want an easy life. I totally get it. I know I do. I want my 4 children to stop screaming at each other and behave like civilised grown up people. Kids need time and space to get used to new things. They need to be allowed to explore that new thing, make up their mind that they want to try it. Then when they try it, they need the freedom to explore it and decide whether they like it or not. Be warned, that may take several times of them trying it. I mean actually trying it so there may be many more times when they don't try it. But the bottom line is you can't force people to like things. Before we even get around to introducing new foods, your child has to feel comfortable at meal times. If they feel stressed and bullied when you present them with new foods, your chances of them trying it are a big fat zero. How would you feel if a waiter brought you a plate of worms to eat and then kept on at you? I bet you're not going to eat them just because he keeps saying "yum! They're so delicious!" What if I told you a secret? A secret that will magic away all that stress and anxiety. You'll just present them with new food and watch it sit there, untouched! Yep, that's the secret! They won't eat it. They won't touch it. They definitely won't like it. 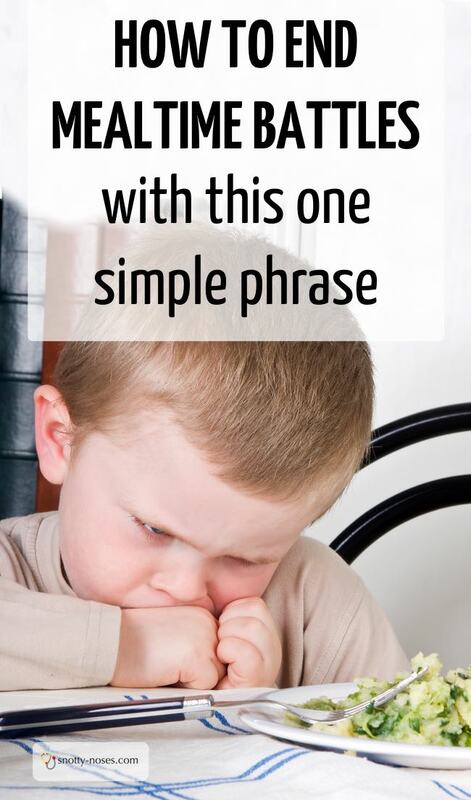 Want to Know the Secret Phrase? "You don't have to eat it!" Seriously! It sounds so simple but once you stop pressuring and stop wanting them to eat, they will relax and the meal time battles will melt away. Please note: I didn't say they would eat the food. The title of the post is "how to end mealtime battles". 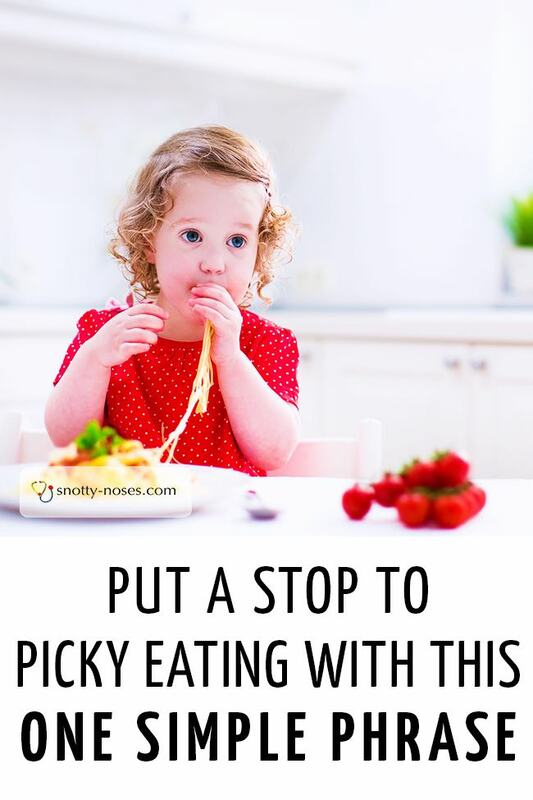 If you still WANT your child to eat, chances are you're still pressuring even if it's somewhere in side. They will know! I'm also not suggesting that they get to eat whatever they want. I'm saying that they get to REFUSE to eat food that is presented to them. As long as there is SOMETHING that is acceptable to them they have an opportunity to eat. If they choose not to eat, there will be another "healthy eating invitation" in a few hours. Allow your children to be in charge of what goes into their mouths. Allow them to choose from a range of healthy foods that you offer through out the day. Have a food routine (breakfast, snack, lunch, snack, dinner) so that they know when the next eating opportunity is. Offer a combination of healthy foods that they like and new healthy foods that you know they won't touch. Get them involved in cooking (even young kids can help cook). Lead by example, let them see you eating and enjoying healthy food. Whenever possible eat family meals. Learn to trust them. Trust them to eat when they are hungry (during the allocated times) but allow them not to eat if they aren't hungry. Now I put on my best "poker face" and place the beautiful pile of ‘extra special cheese on toast’ on the table. Three of the children dive in. The other child doesn’t want to eat cheese on toast. And that’s OK. He has other things to eat (sweetcorn and salad) and I know that if I keep presenting it and don’t pressure him, he will decide whether or not he likes it. I'm not going to sugar coat it, there is no magic cure. You can't "get someone to like something". You can only create an atmosphere in which they're more likely to learn to like it.